What is certain to be one of the top rock performances of the summer has been announced, with the 2019 edition of the Tail Winds Music Fest. The all-day performance will be held on Saturday, June 29th at The Hudson Valley Regional Airport, in Wappingers Falls, New York (gates open at 11:00am). Headlining the show is CHRIS ROBINSON BROTHERHOOD, with additional sets by the likes of BLACK STONE CHERRY, GEOFF TATE'S OPERATION: MINDCRIME, KING'S X, and SASS JORDAN. Pre-sale general admission tickets are priced at $55, and a VIP experience is also available for $150 (tickets for kids twelve years of age and under will be $25) - very affordable prices indeed for such renowned rock acts. 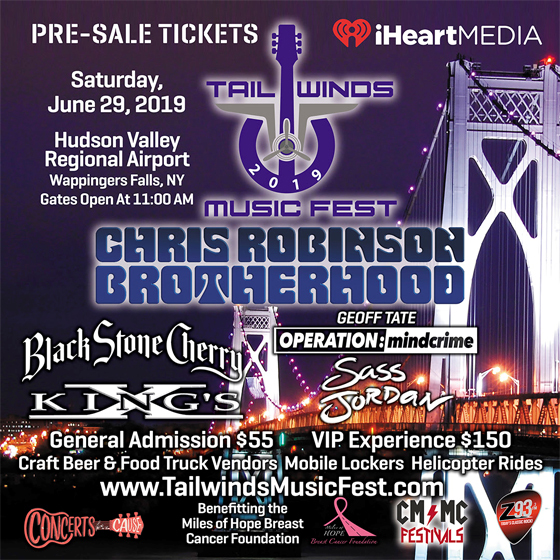 Tickets are available for purchase via tailwindsmusicfest.com.